Physicist-turned-storyteller Ben Lillie opens Caveat, the first dedicated club catering to NYC’s fun-seeking nerds. Caveat is perfectly catered to NYC’s intellectual hipsters. 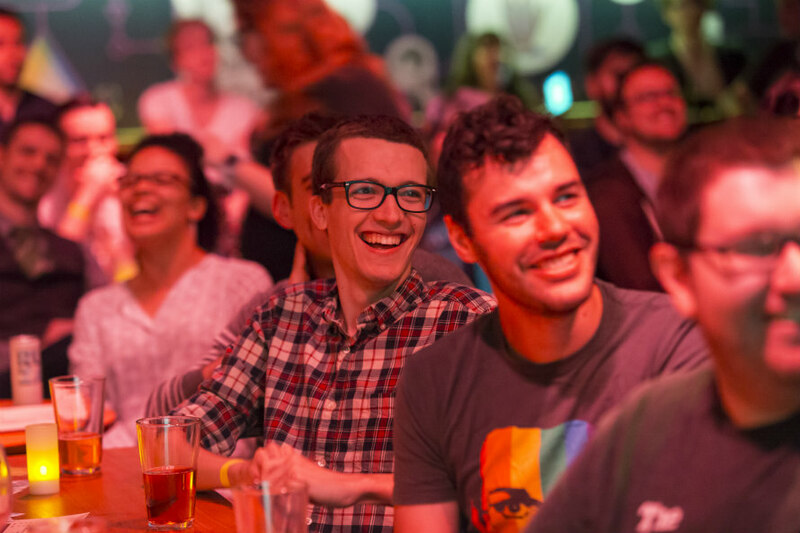 Have you heard the one about the physicist who freaked out over his career choice, walked into many bars to try his hand at stand-up comedy, and eventually launched a business offering “intelligent nightlife” to New York’s vast and growing population of hipster-nerds? If not, you haven’t met Ben Lillie. Lillie and a small band of creative smarties—operating at the curious place where science intersects with jokes—recently opened Caveat, an event space–slash–youthful intelligentsia hangout in a basement that once housed the iconic experimental performance group The Living Theatre. Plenty of opportunities to snoop around the Caveat space. 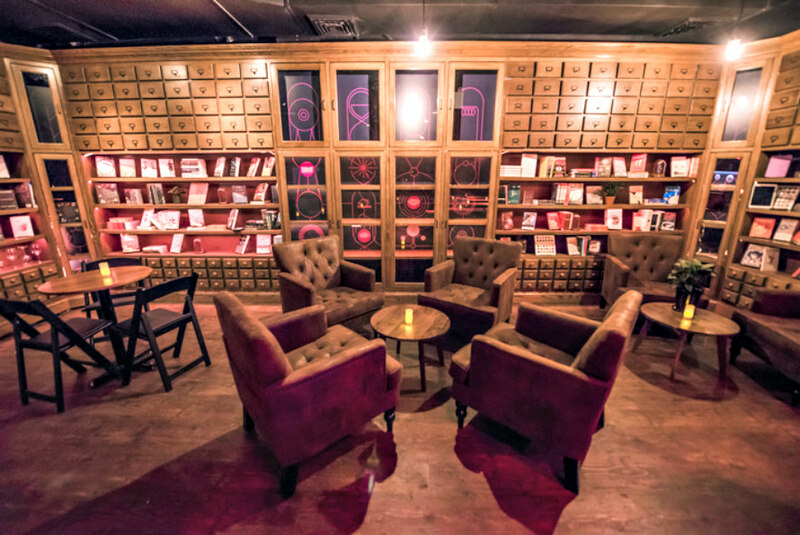 The black box has been transformed into an aesthetic Lillie describes as “Harvard Club meets CBGB.” Books are stacked on tall, blond shelves; curio cabinets are stuffed with international knickknacks, and high-brow beer and global pub grub clutter the tables. Performers, storytellers, and good talkers of all kinds entertain the crowd from the well-lit stage. 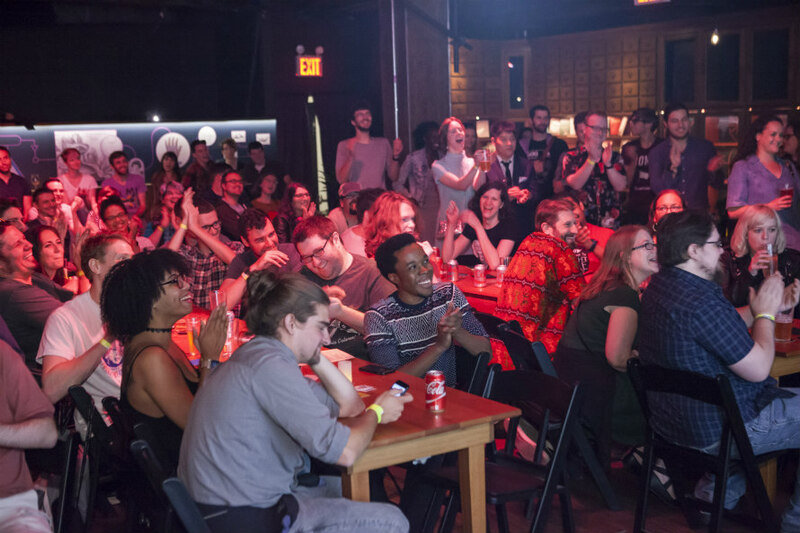 Upcoming events include a live podcast taping of the talk show and inspiration celebration Dedicate It, and an evening of The Story Collider, which mingles Moth-style storytelling and scientific inquiry. The Story Collider series, in fact, plays an important part in Caveat’s origin story. Having emerged on the other side of his physicist-career freak-out, Lillie started The Story Collider with fellow funny scientist Brian Wecht in 2010. He’d fled a lab job in Chicago and headed to New York to crack the stand-up code, which led to improv classes at the storied Upright Citizens Brigade Theatre. His work revealed an audience for clever, academic-leaning entertainment and a need for a physical space to present it. From there the only thing standing in his way was a near project–killing plumbing issue (it involved surprisingly dense concrete and the fact that the upstairs day-care center limited the number of hours jackhammering could be done), which was happily resolved after a month of trying. Audience members enjoying a Caveat show. In the three months since Caveat opened its unmarked doors on the Lower East Side, it seems that approach is taking. “So far, it’s been very encouraging,” says Lillie. “There have been a lot of sold-out shows; we’ve gotten some high-profile praise.” The praise includes mentions in a few of the top taste-making publications of the Caveat crowd: The New Yorker, The New York Times, and New York. All of which bodes well for Caveat’s future and, in turn, Lillie’s mental state. Because going back into the academic family business—his dad is a geologist and professor emeritus at Oregon State University; his mom is a therapist–turned–lavender farmer whose father created and chaired the molecular biophysics and biochemistry department at Yale—is not an option. Until it wasn’t. Luckily for Lillie—and for New York’s fun-seeking nerds—that wasn’t where his story ended.